The most common neck injury happens after an automobile collision. This is the milder injury often called "whiplash". Recent research suggests that the "whiplash" name is not really a good way to think about what happens in this injury. There are few areas in medicine more controversial than this type of injury. In this web site, an attempt is made to present a balanced view about this type of injury. This web site is presented by someone who regularly treats people with this type of injury, but has a bias to select the best treatment for the individual patient, and not a strong bias towards only one mode of treatment. Of course, if a new treatment develops that always cures the problem, in a relatively short length of time, without great risks, then that bias will change. Without trying hard, a person can find statements about this type of neck injury that claim it does not exist as a real injury. The statement is made that the pain is totally psychological, ("It's all in your head") or even worse, that all people who claim the neck injury of this type are just out to make money. The facts suggest that this is not true. In the state of Minnesota, and probably many others, starting a lawsuit for a neck injury without broken bones is a pretty terrible way to make money, unless the injury itself leaves you unable to make money. It is a terrible way to make money, because you cannot make very much money for the time and effort involved. At the other extreme, statements are made that the injury can be so subtle and hidden as to show up six months or even years later, and still be caused by an automobile collision. There are late effects of neck injuries. Also, not seeking help for an injury does not mean no injury. But a problem that really starts six months or more after an injury, with no problems within the first few weeks of the injury, is probably not related. Statements are also made that surgery, or injections, or chiropractic, or physical therapy can cure everyone with this neck injury. As far as I am aware, no one has claimed that pills will cure this type of injury. Medications are one of the most common treatments applied to the problem, but they actually never cure it by themselves. More discussion about medications can be found on the medications page. After all that discussion about what isn't true, what is true? The injury involves a force applied to the body in an unnatural manner. This is shown in the picture (see Picture 1). We are not designed to stand up to force in that direction. Also important, an average size car weighs one and one-half tons. While the cars today are better designed, so they do not transmit all of the impact force to the body, the total force is significant. 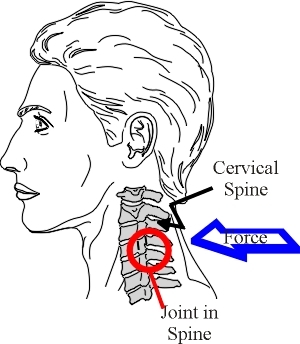 This force jams together the bones in the small joints in the neck, and the best evidence now suggests that the injury is to these joints, when the injury is milder. A more severe injury will damage the discs between the vertebrae in the neck. Clearly, a still worse injury will break bones. The body will respond to these injuries similarly. If the injured person was healthy, did not have an injury to the neck before, and does not have any neck arthritis, then the beginning of the pain is delayed for a short time. Usually, the pain will start within a few minutes to an hour, and become worse over the next day. If the previously healthy person has immediate pain, then there is a much greater chance of a broken bone and x-rays should be taken immediately. The injury of the small joints of the neck described above can happen in a car collision that is not very forceful. With more force, damage to the discs in the neck can happen. This is worse when a piece of disc presses on a nerve. Disc problems in the neck can also happen for other reasons and with other types of force on the neck.